Mesotherapy is the process which involves injecting the fatty tissues with special compounds. This therapy involves a number of treatment sessions which includes injecting various drug mixtures that help you to get the great results you want. Mesotherapy is a non-surgical cosmetic treatment aimed for resolving the skin problems like excess weight, face & neck rejuvenation, reducing cellulite etc. This skin care treatment involves amino acids, minerals, enzymes and vitamins that work together to break fat cells and removes the unwanted cells from the body in a natural way. It is a standardised procedure done with the FDA approved drugs with well trained and licensed doctors. For the best Mesotherapy for Skin in Mumbai, visit Sakhiya Skin Clinic. Facing the problem of cellulite. With uneven skin tone on face and neck. Having unnecessary fat over the skin. Mesotherapy treatment is one of the most sensitive treatments around the world that needs FDA approved prescription medicines and the drugs used by the doctor while treating the patient with this skin treatment. Only a doctor certified with ACCME (Approved Continuing Medical Education Credits) can do this procedure of Mesotherapy. Your skin will get the excellent results by having the smooth and even skin, reduced fat and excess weight and a good-looking appearance. This skin care treatment is less expensive and gives long-lasting results to you. A licensed doctor is appointed for the patient’s treatment. Skin is cleansed and a medicated cream is applied to the area of treatment. Finally, injection is applied to the skin area which includes anesthesia also. It gives better results for our skin than any other treatment. It solves many problems like reducing weight, removing cellulite and body fat, smoothing and tightening of face and neck etc. It will take very less time for treatment with minimum pain and less expense. 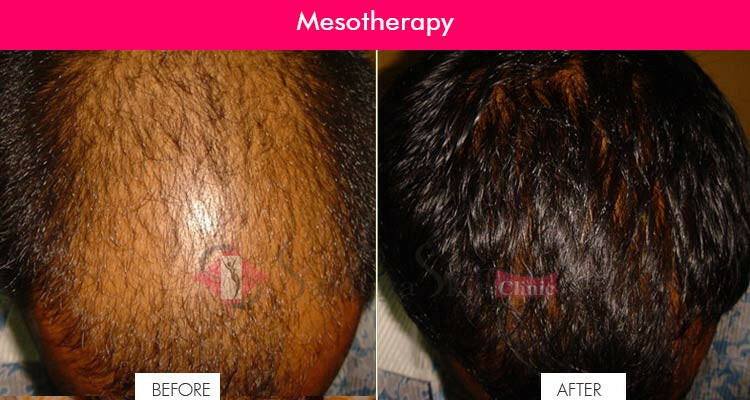 Also, you can avail affordable Mesotherapy Treatment in Mumbai at Sakhiya Clinic. You will get back to your work immediately after your therapy. It may cause lumps and swell over the skin. May feel burning sensation over the skin. Irritation and inflammation may be caused by the treatment. It will have the risk of infection and allergic reaction over the skin. Ans. Mesotherapy is a technique of delivery of drugs, cosmetics, and nutrients in the mesoderm of skin. It consists of performing multiple microinjections into the skin to treat various conditions in aesthetic medicine. IN WHICH CONDITIONS CAN MESOTHERAPY BE HELPFUL? To improve the body shape or facial appearance - an improvement of the skin texture, volume, wrinkling, pigmentation and even sagging treatment of hair loss in men & women. DO I QUALIFY TO RECEIVE A MESOTHERAPY TREATMENT? Mesotherapy for body sculpting and weight loss, cellulite treatment, “mesolift” skin rejuvenation & hair regrowth is suitable for all healthy adults without any age limit. Mesotherapy is usually not a very painful technique. It greatly depends on what is injected and how it is injected. WHAT ARE THE SIDE EFFECTS ASSOCIATED WITH THE TREATMENT? The great thing about Mesotherapy is almost no side effects. There can only be some temporary mild pain, bruising, itching; which will subside eventually. HOW LONG DOES IT TAKE FOR THE FIRST RESULTS TO SHOW? With the use of a proper technique and products, expect the following results for each indication: i. For fat melting & cellulite: from 1 to 2 sessions for the first results to appear. ii. For skin glow: immediately after the first session. iii. Skin rejuvenation and hair regrowth: results appear after 3 to 4 sessions. Results can last for years especially when an appropriate maintenance strategy is applied. For fat & cellulite treatments maintain a good diet & exercise program in order to not gain the weight back. Mesotherapy is a safe substitute for liposuction, solely in the treatment of localized and limited fat deposit & cellulite and/or when surgery is contraindicated.